A smell of smoke was noticed on the flightdeck shortly after takeoff from Greensboro. The crew immediately donned oxygen masks and smoke goggles. At an altitude of 7,000 feet and 15 miles south of Greensboro, the pilot radioed the airport's tower about their problems. The smoke became very dense and restricted the crew's ability to see both the cockpit instruments and the visual references outside the airplane. The cabin crew noticed a smell of smoke, followed by a visual sighting of smoke and sparks in the area of the forward flight attendant jumpseat. The flight crew was able to identify the Greensboro airport and make a successful emergency landing. The airplane was immediately stopped, and an emergency evacuation was conducted on a taxiway. The Board's initial investigation found extensive heat damage to wires and insulation in the electrical panel behind the captain's seat. The heat was sufficient to blister the primer on the fuselage crown skin. Four crew members received minor injuries from smoke inhalation in-flight and one passenger received a minor injury during the evacuation. 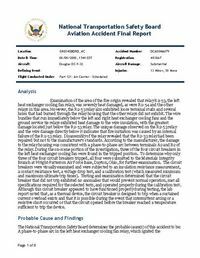 The airplane was substantially damaged from the effects of fire, heat, and smoke. PROBABLE CAUSE: "A phase-to-phase arc in the left heat exchanger cooling fan relay, which ignited the surrounding wire insulation and other combustible materials within the electrical power center panel. Contributing to the left heat exchanger fan relay malfunction was the unauthorized repair that was not to the manufacturer's standards and the circuit breakers' failure to recognize an arc-fault." Distance from Greensboro/High Point-Piedmont Triad International Airport, NC to Atlanta-William B. Hartsfield International Airport, GA as the crow flies is 489 km (306 miles).